Italian family of rabbis. Formerly the name was as a rule transcribed Figo; in an Italian document of 1643 it appears in the form "Pichio"; and in Hebrew it is sometimes written . 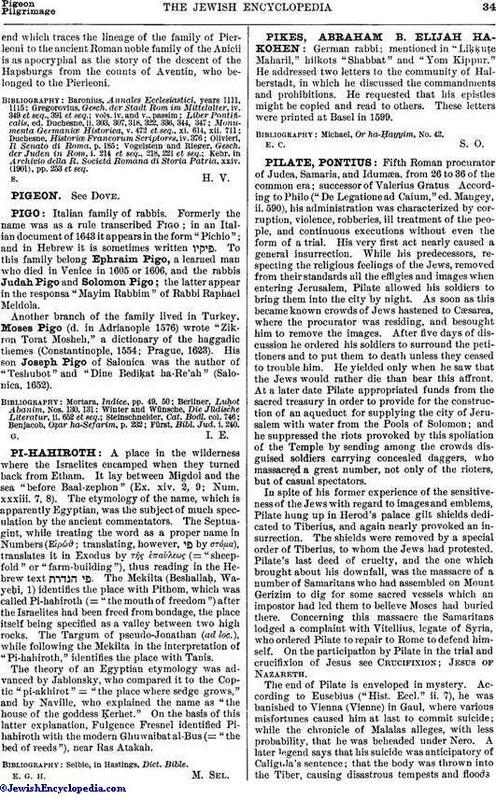 To this family belong Ephraim Pigo, a learned man who died in Venice in 1605 or 1606, and the rabbis Judah Pigo and Solomon Pigo; the latter appear in the responsa "Mayim Rabbim" of Rabbi Raphael Meldoia. Another branch of the family lived in Turkey. Moses Pigo (d. in Adrianople 1576) wrote "Zikron Torat Mosheh," a dictionary of the haggadic themes (Constantinople, 1554; Prague, 1623). His son Joseph Pigo of Salonica was the author of "Teshubot"and "Dine Bediḳat ha-Re'ah" (Salonica, 1652). Fürst, Bibl. Jud. i. 240.